A must watch for kids and adults alike! We saw this movie twice (for Vit's case only) and we still loved every minute of it. It was a great movie with excellent humor and lovable characters. 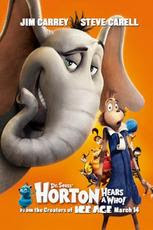 The film is based on the book by Dr. Seuss about an elephant who hears a speck of dust that is actually talking and features the voices of Jim Carrey and Steve Carrell. Even though based on a kid's book, it showed many lessons about life. One example could be about never being too closed to change. For us, the movie offers a lot of open-ended interpretations. Ironic isn't it? We didn’t really expect the movie to be so much fun – it was cute, funny, and even moving. We recommend this movie to everyone, one of the best animated movies we have seen for quite sometime.